Roads Ministry (Tibilisi, Georgia 1975). Architect: G. Chakhava, n.d., digital C-print, 31 x 31 1/2". The first photograph one encounters in this brilliant, modest exhibition depicts a gigantic circular structure built in 1967 to host a permanent circus in Kazan. Originally rejected by the government for its resemblance to a UFO, it now seems more like a mysterious time machine—a ruin that has survived the fall of the Communist empire. 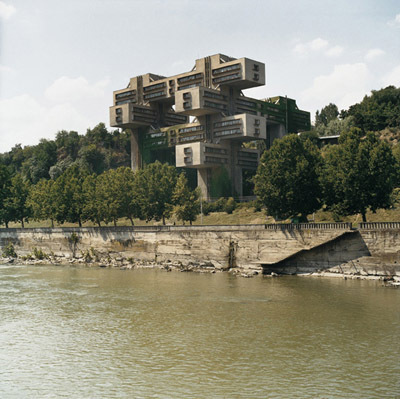 Bringing together approximately fifty images by French photographer Frédéric Chaubin, “CCCP: Cosmic Communist Constructions Photographed” presents a surreal journey through two decades of visionary architecture, spread across the former Soviet Union. Private villas adorned with zoomorphic forms alternate with colossal public structures, all developed in a time of political isolation. But don’t expect to see primitive or vernacular creations. This is architecture at its wildest and best, a triumph of eclectic shapes, rampant constructions, and byzantine details, all speaking to a desire to build the world anew. “CCCP” is a Piranesi-like landscape of phantasmagoric plasticity and utopian tension; one magnificent example is the Roads Ministry edifice built in 1975 in Tibilisi, Georgia. Rising like a Jenga tower, it strikes a futuristic silhouette while playing daringly with the rugged topography of its site. Other examples include a resort mistaken by US intelligence for a rocket-launching facility, a ceremonial wedding palace that resembles a wedding dress, and a crematorium that recalls a gymnasium. The photographs are accompanied by a time line sketched on the floor. Running from 1969, the year of Mies van der Rohe’s death, to 1991, the end of the Warsaw Pact, the chronology aims to remind us that each country develops its own idea of modernity—each equally valid, equally hallucinatory.